The beginning of my trip is over here. Thanks for reading. 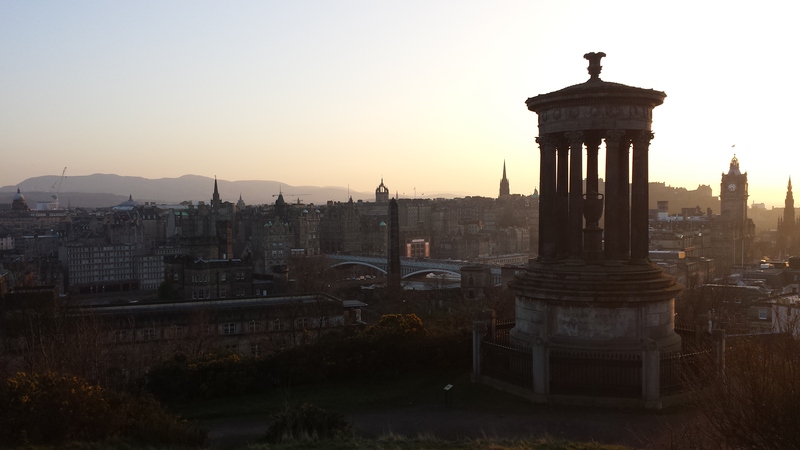 It didn’t take long for Edinburgh to offer me everything I ever wanted out of a city. Of course, I mainly say this because I was very hungry, had been walking all morning, and the radio in the place we found was playing R. Kelly’s Remix to Ignition. Either way, stopping in a place called Oink was such a good decision that we had to do it again the next day. There’s something about a sandwich made with a half pound of pork, haggis, and topped with a piece of crackling that did my soul right. 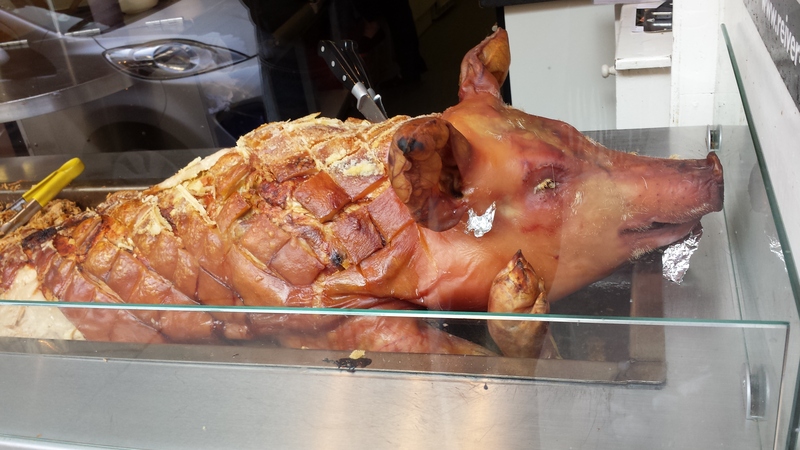 Oh, and the pig I was eating was just sitting in the window. See? Look at this guy. Of course, this odd little shop, which was a fun blend of traditional Scottish food and modern quirkiness, sat just around the corner from the Royal Mile. The old road leads from Edinburgh Castle down to the Scottish Parliament building, a connecting path from the old to the new. It goes from a medieval fortress built to withstand English attacks and a post-modern oddity built to hold onto Scottish independence. 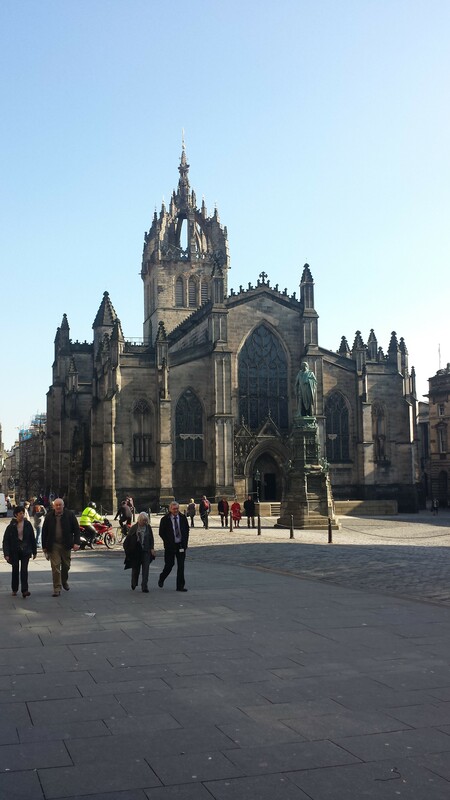 Like a city built in the innovative vein of Gershwin’s Rhapsody In Blue, Edinburgh has old and new, past and present, classical and jazz, all wonderfully connected yet still distinct. 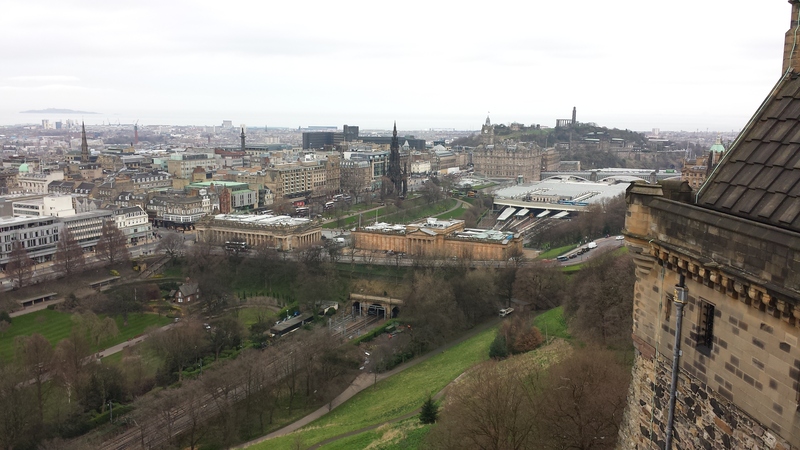 Edinburgh grew upwards well before it grew outwards. Since the city was founded in order to protect itself from attacks, it had to be built in close quarters in a compact, strategic area. As the population grew, the city moved upward and buildings became somewhat of early skyscrapers. 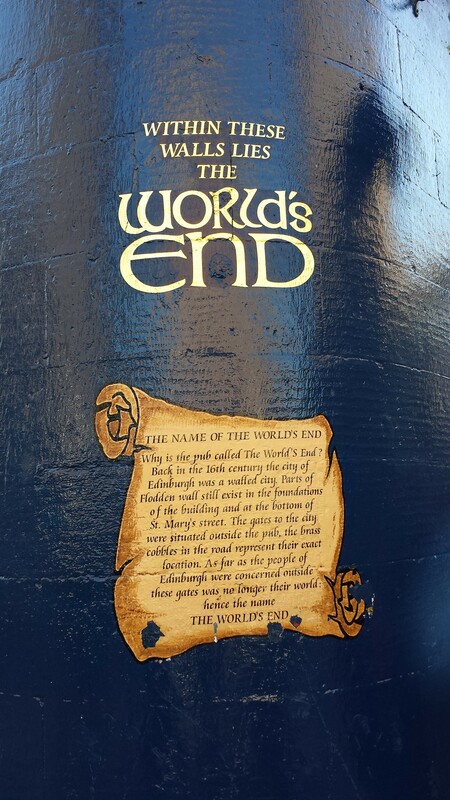 Before the original city walls were removed for more outward expansion, the city’s end marked what the citizens called “the world’s end”. In the 1700’s, Edinburgh finally decided to expanded outward, and the New Town section of the city was born. Resting parallel to the Royal Mile and the Old Town, this “new” section was built using more of a classical approach, differing from the medieval Old Town. Of course, since then, the city has expanded greatly, but still, Old Town and New Town sit next to each other, forming the centerpiece of the beautiful city. Interestingly enough, Waverly Station, the train depot, rests directly between these two sections of the city. It serves as a divider between the city built to withstand attack and a city built to embrace the future. It is a juxtaposition between the past and the fight for independence and the present, where independence takes a much different form than firing cannons and clanging swords. Edinburgh really is a place that in the midst of blending the past and present, still offers a stark contrast. The castle, perched proudly at the top of a hill, holds monuments to the heroes who fought against the British for the sake of Scottish independence. Though on this day, there’s plenty of talk down the hill in Parliament about whether that could be feasible at this point in time. The past and the present offer significantly different approaches. It makes me think about my past. My mothers family comes from the MacGregor’s, a Scottish highland clan with a tricky past. The larger Campbell clan wanted the land the MacGregor’s held, so they displaced them, which wasn’t too uncommon back then. What was pretty uncommon was that the MacGregor’s responded by becoming outlaws who lived by raiding the Campbells. This continued for a while, until the Campbells got mad, petitioned King James, and he made it illegal to be a MacGregor. For nearly 200 years, until 1774, the name itself was a crime, causing many MacGregors to temporarily change their names to things such as “King”, hinting at their roots in the ancient kings of Scotland. Hence where my mom, the rest of the King family, and my past comes from. But I couldn’t help but think about my present as well. Where Edinburgh built upwards, Jackson, Mississippi expanded out quickly, abandoning what sat in the middle. Until the 1960’s and 1970’s, Jackson was rapidly growing. Like most urban areas the downtown region was seeing the emergence of taller office buildings and more of a business focus. Then, culture started to change, catalyzed by desegregation. The city didn’t know how to respond or didn’t want to respond, so the people left. Moved outward, abandoning the heart for the outskirts. Even now, you can drive downtown in Jackson on the weekend and see where progress stopped. Most other urban areas have newer, taller buildings towering over those built 40 years ago. Not Jackson. Capital Street, where the white population would go for shopping, eating, and entertainment, is only a block away from Farish Street, the historic home to the exciting African-American blues and jazz community of yesteryear. Both streets sit nearly empty these days, as only offices exist downtown, and nothing happens on the weekends. I wonder about Jackson. I worry about it, really. Sure, there is a growing population of being who actually care again, but is it enough? Is it enough to have my neighborhood, the “trendy” neighborhood, grow while weekends downtown still lie nearly empty? Did Edinburgh go through periods like this? 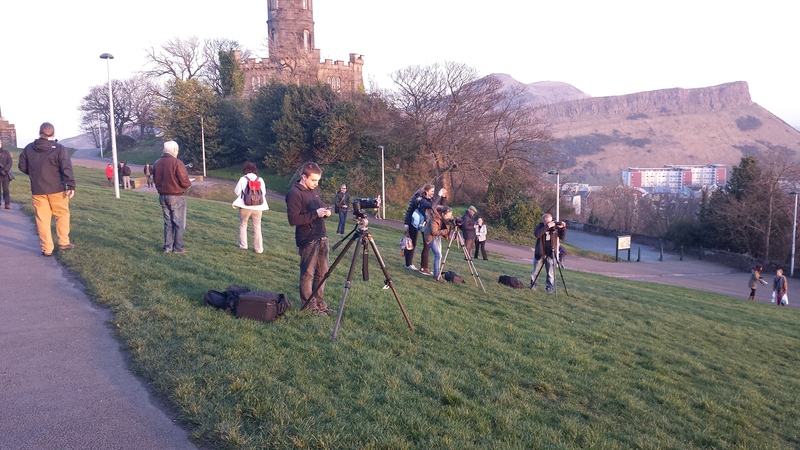 Sure enough, as soon as you top Calton Hill, you see the building that isn’t finished yet. It is the National Monument, the start of a replica of the Greek Parthenon. Started in 1826, funding quickly ran out and by 1829, builders had decided to just stop working on it. Thus, what was supposed to be a monument to soldiers who died in the Napoleonic Wars now sits as a facade. A testimony to things going wrong, but also to the fact that, as our hotel employee stated, things aren’t finished yet. I love how he worded things. He could have called it some of the more derogatory nicknames it has, like Edinburgh’s Disgrace. Yet he hinted at something that I find beautiful, and that’s the fact that what Scotland calls their National Monument isn’t finished yet. Much like that proud wartime history, much like that nearly unending desire for independence, and much like that constant upward and outward growth, it is unfinished. You could look at Scotland and see them as a nation that was almost there but not quite, falling short of the ultimate goal. Or you could look at it in the words of our friend in the hotel: as a place that isn’t finished yet. The past and present exist together to constantly remind us of the passing of time and the fact that we aren’t done yet. Maybe Jackson is the same way right now. It was abandoned, but that doesn’t mean it has to die. The MacGregors were outlaws and were even hunted during the days of Mary, Queen of Scots. Yet they stuck together, survived, and even still fought in battles for Scottish independence next to those who had labeled them as outlaws to begin with. They survived, even when maybe they shouldn’t have. That’s how it is for us. For Edinburgh. For Jackson, Mississippi. For me as I sit at a laptop typing and wondering what in the world I’ll do when I get back home. It could be easy to look at our individual or collective failures and see them as disgraces or mistakes. It is always easier to run away. But what takes work is to refuse to see things that way. It takes work to make progress, to grow, and to bring things back to life. It can happen in the most cynical of hearts and the most dead of cities. It starts with perspective: not seeing failures as disgraceful monuments to stupid mistakes, but seeing them as the start to build upon. 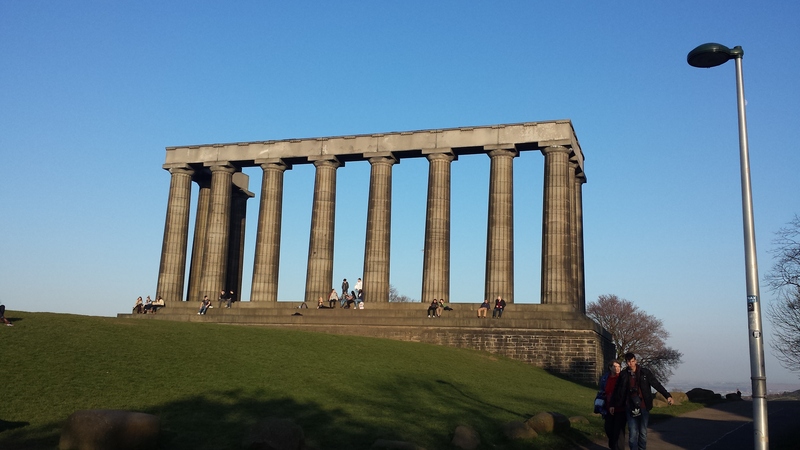 Oh my gosh, Edinburgh is one of my favorite cities I’ve wandered, and Calton Hill is one of my favorite all-around places on Earth. I had a magical time there six years ago, and sounds like you did too. “Not finished yet.” Love that. Will always think of that line whenever I think of that view.